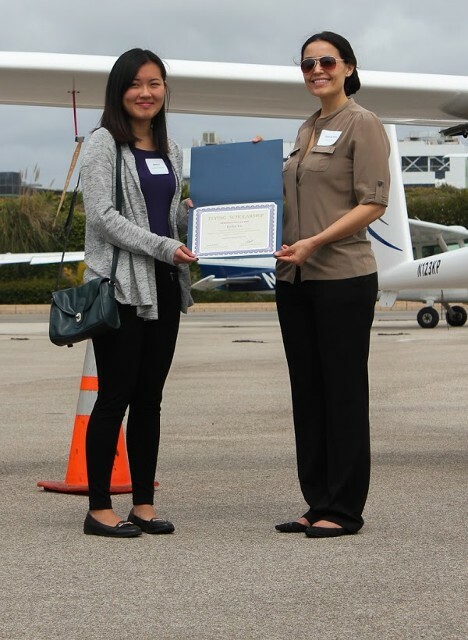 A flight training award for high school students age 15+. A Science Technology Engineering Mathematics (STEM) related effort. Above: Helen Lu (right), this year's winner, receives her training material from Claire Goldberg (left), last year's winner. Above: Finalists and their teachers, from left: Analisa Burns (Samohi sophomore), Karynn Adams (1st alternate. Venice High School sophomore), Haygo Salibian (Venice H.S. teacher), Chloe Hallinan (Archer School senior), Shane Berning (Archer School teacher), Samirah Zaina (principal donor and instructor), Kelly Okla (Samohi teacher), Helen Lu (2015 winner, Samohi junior), Claire Goldberg (last year's winner). Missing are Finalist Jennifer Solares (junior at Westchester Magnet), Ed Lord, and Rick Nelsen (teachers at Westchester Enriched Sciences Magnet high school). 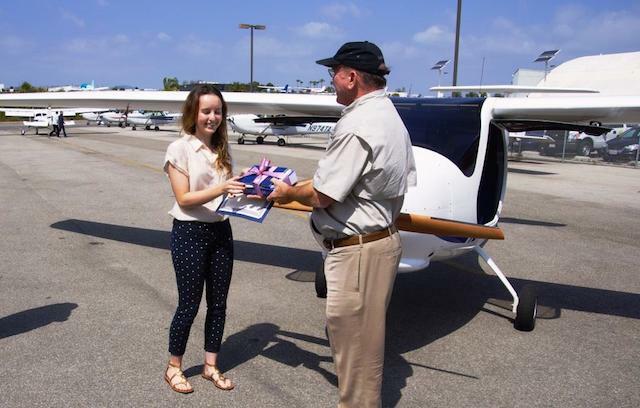 Santa Monica, CA, March 22, 2014: Claire Goldberg, a Santa Monica High School (Samohi) 11th grade student, was announced the winner of the Flying Scholarship for Girls Joe Justice award. Claire received her award at a ceremony at Santa Monica Airport on Saturday March 22, 2014. Clara Glassman (12th grade) was the first alternate and Kiana Saberi (12th grade) was the second alternate. The event was attended by the Samohi finalist students, their parents, Samohi advisor Al Trundle, the judges, the donors, and the Scholarship’s volunteer staff. 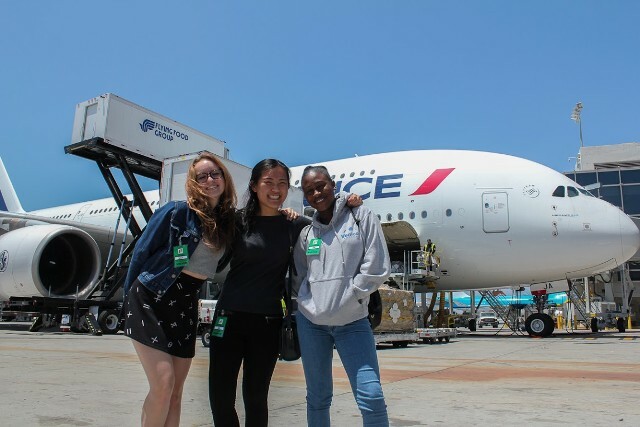 Flying Scholarship for Girls is a Science Technology Engineering and Math (STEM)-related effort designed to encourage high school girls to explore opportunities in aviation and aerospace, by helping them realize their dream of learning to fly. Samohi Finalists and their high school advisor - From left to right: Gabriella Dyrek (junior), Claire Goldberg (junior, and scholarship winner), Kiana Saberi (senior), Clara Glassman (senior), Al Trundle (Samohi Advisor) Absent from the photo is Shelby Wolf (sophomore). 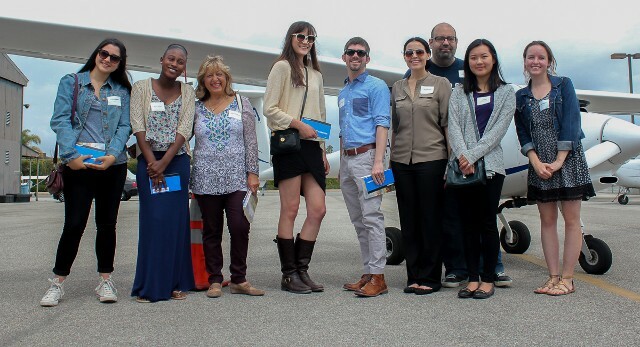 A small group of volunteers got together to create this scholarship for public high school students interested in learning to fly. Funds are solicited through fund-raisers and online at www.flysmo.com. Each award is named after the main contributor. For example the Joe Justice Award was made possible through flight instruction time donated by Joe Justice, owner of Santa Monica-based flight school Justice Aviation. The airplane time–to be flown in a green Pipistrel Alpha Trainer–was a donation from Kelar Aviation. The winner of the scholarship receives 30 hours of airplane and instruction time during a 30-month period. Although a Light Sport Pilot’s license is the stated objective of the scholarship, the students learn about aerodynamics, theory of flight, meteorology, geography, navigation, propulsion systems, mechanical systems, electronics, electricity, communications, mathematics, flight planning, safety, regulations, and piloting techniques. The scholarship was announced last November, and Samohi candidates in the 10th, 11th, and 12th grades submitted their applications online last December. After review by a panel of judges and reviewers, five finalists were selected. 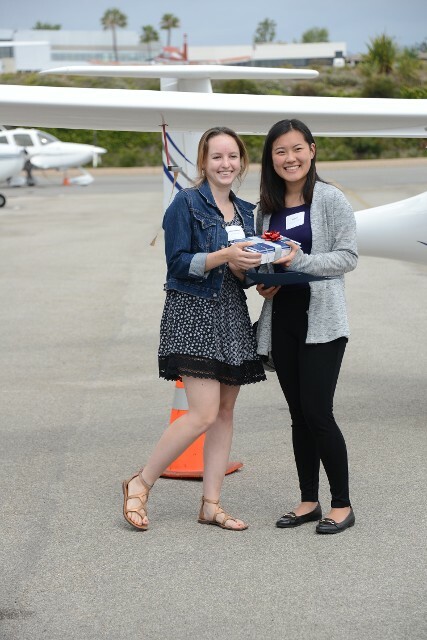 The finalists underwent personal interviews at the Museum of Flying by a panel of judges, which included a girl from another high school who has been learning how to fly. The principal driving force behind this scholarship effort is the belief that providing unique educational opportunities to our next generation will lead to a better future for society. By providing a formative opportunity at a young age, we hope to help our future generation realize their dreams and aspirations. Hopefully one or more of our young scholarship recipients will be able to contribute to the society when it is their turn and the future is in their hands! This scholarship is one such small and humble effort towards that goal. This is a Scholarship for a "Sport Pilot" license. Flight training and ground instruction is for a maximum of 30 flight hours and remains valid for 30 months after the award date. 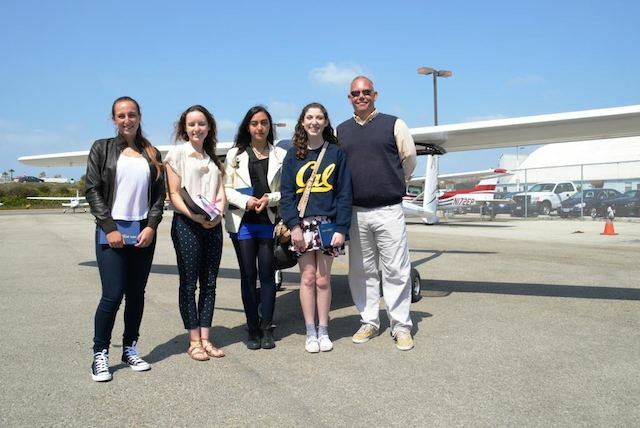 This program is subject to availability of aircraft, flight instructors, and the Santa Monica Airport. Your parent or guardian's permission is required. Please complete and submit the form, found under the "How to Apply" tab, to apply. Your essay is important. The selection committee is interested to learn about you, who you are, your character, your motivations, your interests, hobbies, school & after-school activities, and WHY you want to become a pilot. There are no right or wrong responses. Just be yourself, and write as you wish. If your application is accepted for consideration, you will be asked to submit your school transcripts for the last two years. 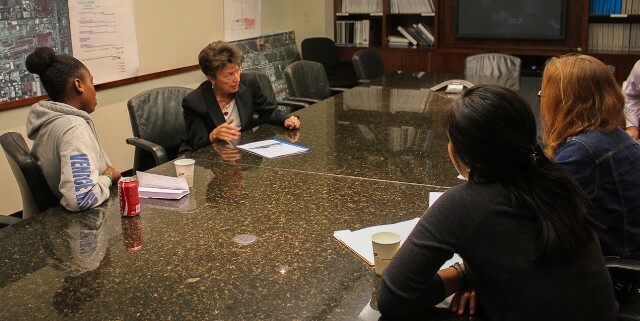 The next step will be an interview for finalists which will be held at the Museum of Flying at Santa Monica Airport.